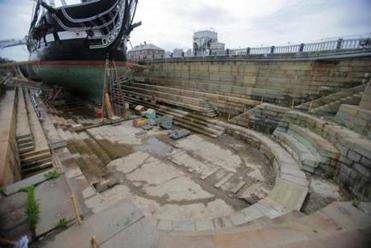 A multi-year restoration of the USS Constitution began Tuesday. Restoration work on the USS Constitution — the world’s oldest commissioned warship afloat — began Tuesday morning with the ceremonial removal of one copper sheet from the ship’s hull, officials said. The ship’s captain, Commander Sean Kearns, and the president of the USS Constitution Museum, Anne Grimes Rand used a crowbar to pry off the first copper sheet as a symbolic start to the ship’s restoration, said Petty Officer Peter Melkus, a spokesman for the Constitution. The restoration is expected to last more than two years and cost $12 million to $15 million, which will be paid by the Navy. The 4-by-2 foot copper sheet was taken from Dry Dock 1 in Charlestown Navy Yard, where the ship is currently docked, to the USS Constitution Museum for guests to view. Also at the museum, guests will be able to sign their names to each of the 3,400 copper sheets that will be used to re-copper the ship’s wooden hull toward the end of the restoration, the Navy said. Old Ironsides’ hull is layered with copper sheets to protect the ship below the waterline by preventing shipworms and other marine life from eating away at the wooden hull planking. The restoration will also involve replacing any rotted or warped wood and maintaining the ship’s masts. Beginning Tuesday, visitors will be able to explore the top deck of the ship every Tuesday to Friday from 2 p.m. to 6 p.m., and every Saturday and Sunday from 10 a.m. to 6 p.m. They can also take photos by the ship’s wheel and bell. Crew members will be aboard to explain the Constitution’s history. The visit is free. The goal of the restoration is to return the Constitution to its original state, Melkus said. “One of the ultimate goals each time we restore the ship is to get her closer and closer to how she looked in her War of 1812 configuration,” he said. Since the Constitution is restored once every 15 to 20 years, blueprints of her sister ships are often newly discovered in the interim. 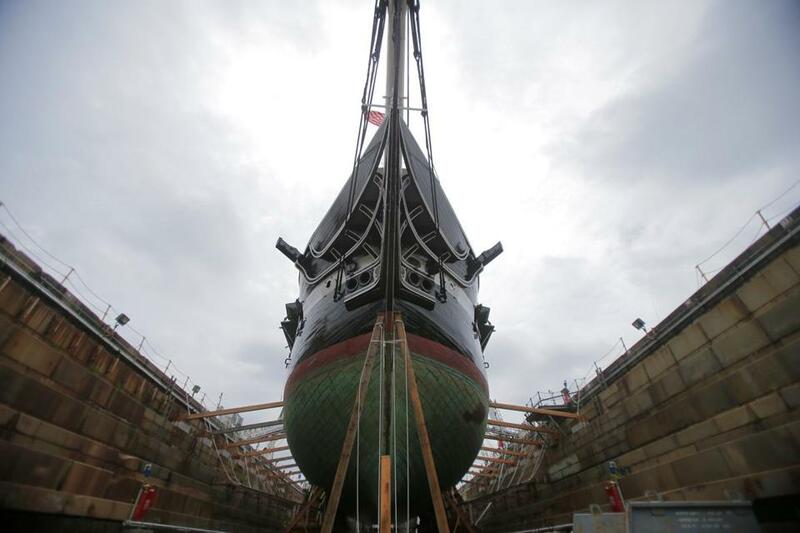 Each restoration brings Old Ironsides closer to her original form, Melkus said. The ship’s last restoration took place from 1992 to 1996. The Constitution, which is the sole survivor of the Navy’s original six frigates, operated from 1798 to 1854. It captured 33 vessels during that time and is best remembered for three victories against British Navy ships in the War of 1812. Aneri Pattani can be reached at aneri.pattani@globe.com. Follow her on Twitter @apattani95.